Available in a wide range of temperatures from (80°C–105°C) to (150°C–210°C) to suit a variety of dif ferent applications. * Actual temperature range depends on conditions of use including contact time, materials, pressure, and air flow. 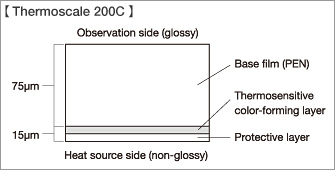 Color of THERMOSCALE sheet turns black when coming in contact with the heat source. A shorter contact time produces paler colors. As the contact time increases (at the same temperature), the colors become deeper. 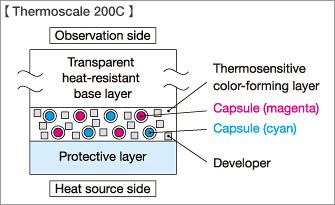 Note that the color change is also influenced by factors such as the type of material on the opposite side (i.e., the non-heat source side), thermal characteristics, contact pressure and air flow (see below). In general laser copiers (multifunction printers) used in offices, fusion rollers —which are heated— use heat to melt toner and fuse it to paper to portray letters and pictures, etc. However, if heat is unevenly distributed or if there are scratches on the surface of the fusion roller, copying cannot be carried out properly. By using THERMOSCALE, you can determine if there are any heat irregularities or slight scratches on the surface of the fusion roller.